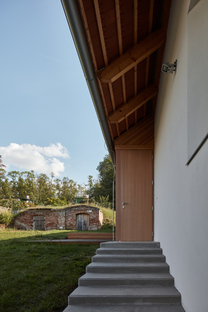 The Czech architecture firm, ORA founded by Jan Hora, Barbora Hora and Jan Veisser has designed a country house in Moravia, exploring a contemporary context that bears little relation to the noble idea of the countryside as a pleasurable environment. When we think of villages in the country we tend to conjure up images of small cottages, the warm and friendly vernacular architecture of our grandmothers, distinguished by the materials used in their construction. But if you take the trouble to carefully observe the fabric of contemporary villages in Europe, irrespective of the country, you'll see that nothing could be further from the truth. So the latest project by Czech architecture firm, ORA founded by Jan Hora, Barbora Hora and Jan Veisser is an example of what really happens in the places that city dwellers believe to be idyllic. 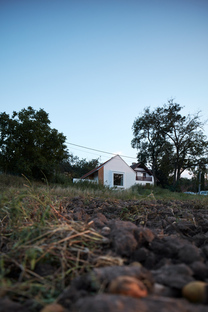 Beginning with an exploration of the concept of a contemporary village in Moravia, a rural zone surrounding Prague, the architects unveiled a highly ambiguous world, particularly when it came to the actual definition of a country house. In the villages, nobody seems to be particularly concerned with the historical context and the surrounds of the settlement. 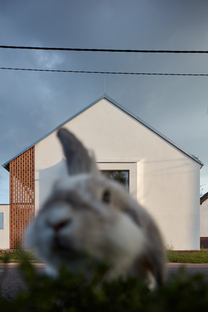 They simply tend to build the semblance of an introverted urban villa erected in the middle of a property, preferably tucked away behind fencing, isolated from the others and therefore often not even interacting with the actual countryside. This attitude is foreign both to our image of the village and to the historical past where the rural community was much more physically connected. Bearing this in mind, ORA decided to build a construction that would respond to the major urban planning crisis of these places by being more open and wanting to interact more deeply with the context. 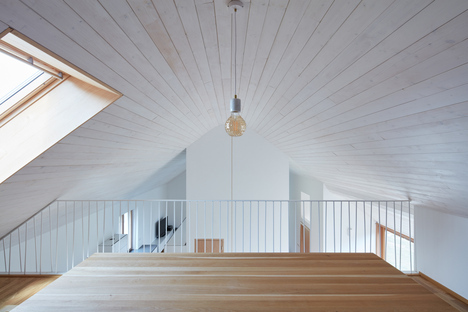 The house in Božice, south Moravia is positioned at the edge of the village centre on a narrow, sloping site. The scale of the house corresponds to the scale of a local traditional homestead. 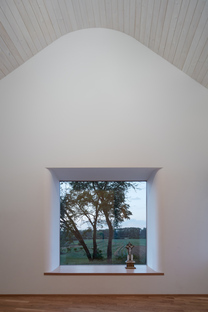 It was built very close to the street where a large window replacing the garage is a symbol of the connection between the house and the public space. Again in keeping with tradition, a private courtyard behind a wall guarantees the privacy of the occupants. 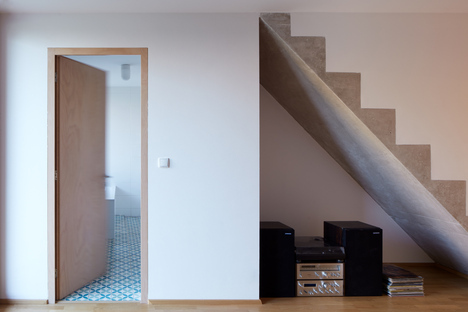 The idea of rammed earth was abandoned in favour of the more conventional concrete blocks. The red roof and the white walls of the exterior are reminiscent of the rural language and the traditional porch provides a pleasantly shaded zone for the hot Moravian summers. 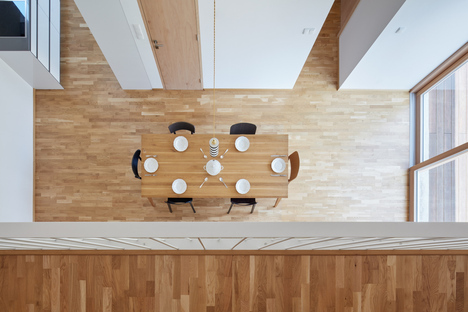 The architects placed particular emphasis on the windows, whose shape and positioning starting with the bay window, aims at really making the most of the views and of setting up a relationship between the house and the street. That choice reiterates the contemporary language of this country house without falling into the trap of excessive romanticism. 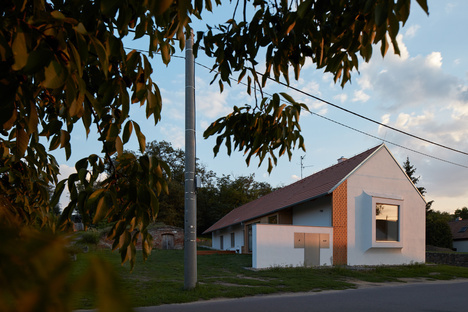 The house designed by ORA in Božice represents rural architecture with the clear intention of improving its local context, all with refreshingly new solutions that do not take the easy path of nostalgia.